TraVigne Villas Cupertino condo development with 46 residential units is mixed-use project built in 2003 on the land previously occupied by deteriorated strip-mall. TraVigne (trah-veen-yay) means "living among the vines" in Italian. This like new condo complex located at 19999 Stevens Creek Blvd near intersection with Blaney Ave. The two-story commercial building with 5,500 s.f. retail and 6,000 s.f. office space fronts Stevens Creek Blvd while three-story condo building sits along Blaney Ave.
TraVigne Villas condo located within walking distance to these Cupertino schools: Collins Elementary, Lawson middle and Cupertino High. Right now this Cupertino condo complex presents a tricky choice. 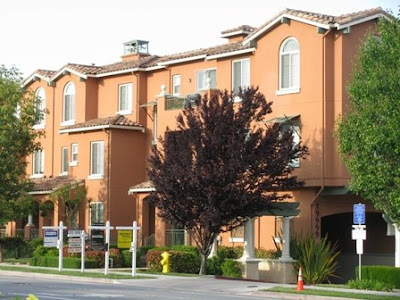 There is two bedroom/two bathroom unit for rent at 19999 Stevens Creek Blvd for $2275 and in the same time similar condos are for sale at TraVigne Villas Cupertino with asking price around $565,000 plus homeowner's association fee in $410 per month. Considering current low mortgage rates the monthly ownership of condo with 20% down payment in TraVigne Villas would cost at least around $2,400 in mortgage payments, $410 in HOA fees, $500 in property taxes. Most likely condo owners would use itemized deductions while paying taxes, so I would estimate the total home ownership of this Cupertino condo would be around $2,900 per month.